A&E welcomes Rustic Remodel to their line-up starring Kate and Paul Allen. Airing March 23rd, 2019 11/10c am. Rustic Remodel focuses on the founder/couple of Rustica, as they put a “Do It Together” (DIT) spin on traditional “Do It Yourself” (DIY) home projects. Kate and Paul’s DIT values helped them to build Rustica from the ground up and live their dream of working together to bring soul to their customers living spaces. 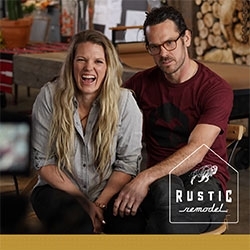 Springville, UT, March 19, 2019 --(PR.com)-- A&E welcomes Rustic Remodel to their line-up starring Kate and Paul Allen. The one-hour special airs Saturday, March 23rd, 2019 11/10c am. Rustic Remodel, primarily sponsored by The Home Depot, Stainmaster, and Little Giant Ladders, focuses on the owners of Rustica Hardware, as the couple puts a “Do It Together” (DIT) spin on traditional “Do It Yourself” (DIY) home projects. Kate and Paul’s DIT values helped them to build Rustica from the ground up. Working side-by-side the couple designs and sells functional art for family homes full of soul and rustic charm. Rustic Remodel will take you on Kate and Paul’s DIT journey as they manage their business, design functional art and sweep each other off their feet. The Rustic Remodel pilot episode focuses on the Jenkins family who came to Kate and Paul for barn doors for their home but ended up having their lives changed by receiving a complete home refresh.